VashonAlliedArts.org hosts an important lecturer on earthquakes, coming to Vashon in November. Today’s Vashon Beachcomber had a bunch of great quotes that Susan Riemer got from next week’s expert speakers. She especially covered the little reported tsunami risk that could damage our ferry docks, certain waterfront locations (those perpendicular to the surge), and perhaps the isthmus between Vashon and Maury Islands. Some information on this can also be found on our tsunami page. Art Frankel and Craig Weaver of the U.S. Geological Survey gave a presentation to the Seattle City Council on Monday (as noted in this agenda) that has raised some eyebrows – and reaffirms our sensitivity to upcoming seismic disturbances. See their PowerPoint presentation or read on for a few copies of a few of their slides. In 2014, there will be a regular 6 year update to the National Seismic Hazard Maps. A workshop on the Pacific Northwest Portion of this was held locally on March 21-22, 2012. The March 28th edition of the Vashon Loop put notice of our Annual Meeting in the lead position at the top of page 1! Given the interest I’m hearing about, I think we may have a very full house, as we only have room for some 300 people in the Chautauqua Multipurpose Room on April 18th. 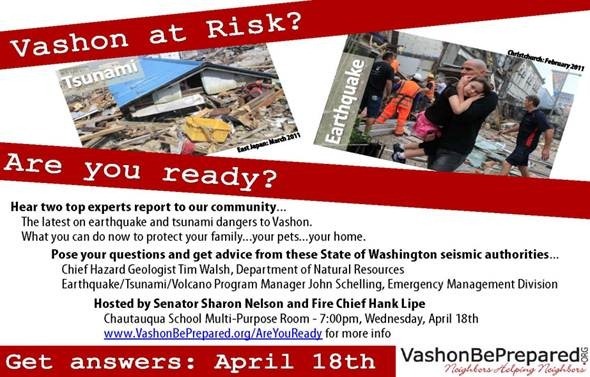 Two State Experts on Vashon Earthquake & Tsunami Risks + What You Can Do for your Home, Family & Pets! A 210 foot long fishing boat lost in last year’s March 11th Japan tsunami is about 150 miles off of the Canadian coastline according to a new news story on the Canadian Yahoo site. Is Vashon at Risk for Tsunamis? Most folks think of an overseas or Cascadia based quake as generating a terrible tsunami – and they are right. However such a tsunami is not likely to cause massive damage to Vashon from what I’ve heard – largely due to the moderating influence of the Straits of Juan de Fuca. (It will be interesting to verify this at our upcoming April 18th community meeting with Washington State experts). In “Quake catastrophe like Japan's could hit Pacific Northwest, new data show” M. Alex Johnson of msnbc.com also reports on last month’s reports at the American Association for the Advancement of Science – noting that the Cascadia quake has numerous parallels with Japan’s Tōhoku disaster one year ago. According to Bill Steele, the public is woefully unprepared for a certain disaster: we just don’t know when. Mr. Steele is Seismology Lab Coordinator for the Pacific Northwest Seismograph Network (PNSN) at the University of Washington Department of Earth and Space Sciences where he has worked since 1993. Just a brief note to commemorate those whose lives have been disrupted and lost by the Tōhoku disaster one year ago today. Cascadia Mega-Quake Threat: Even Larger than Previously Thought? Do you know Washington’s four kinds of earthquake sources? Cascadia Subduction Zone Example: the 1700 earthquake that caused shaking and a tsunami that inundated the Oregon coast and reached as far as Japan. FEMA P-811: Earthquake Publications for Businesses (QuakeSmart Toolkit)–Just Released! Identify your risk Make a mitigation project plan Implement techniques for ensuring and enhancing business resilience What a great new goal for Vashon businesses in 2012! CBS recently listed a number of sobering facts about earthquake insurance that anyone from a scesmicly active area - like those of us from the Salish Sea would do well to be familiar with. Most know it isn’t included in standard homeowner’s policies, but even with it beware of the large number of restrictions in comparison to fire or other policies. Hazus is a nationally applicable standardized methodology that contains models for estimating potential losses from earthquakes, floods, and hurricanes. Hazus uses Geographic Information Systems (GIS) technology to estimate physical, economic, and social impacts of disasters. HAZUS-MH is software developed by FEMA that analyzes risk from natural hazards in communities. Although Hazus-MH itself is free, it requires the users to have ArcGIS with ArcView license level. KING 5 News reported today a swarm of earthquakes in recent weeks around Mount Rainier: nothing especially exciting, but an alert that it IS an active volcano! Read the full story here. For the latest view of regional quakes, always visit www.pnsn.org/req2/. If you appreciated my 14 March post that mentioned the ABC site showing before & after images of some tsunami scenes, you’ll likely also appreciate this somewhat similar set of photos from the Sacramento Bee that show 3 sequential images shot from the same perspective – of maybe a dozen different scenes. Thanks to Cathy Rogers & Jill Watson for alerting us to these. Oregon and Washington are likely to have a very serious earthquake in future decades, according to a disturbing article in the Oregonian. If you’ve not come across them, Paul Nichols has created several time lapse earthquake maps. Working at the University of Canterbury's Digital Media Group, he takes USGS or GeoNet data and plots it using the Google Maps API to create a fascinating animation. Are your bookcases secured - or your water heater? There are often personal tasks that we all need to accomplish - but need a bit of advice or to see the basics before tackling these projects. The following were designed for exactly this purpose! For our media outreach efforts, and for individual preparedness, please be aware of the following videos produced for Washington residents. These videos were produced in partnership with Kitsap County Department of Emergency Management and the Washington State Emergency Management Division. Funding for the project was made possible through grants from Governor Christine Gregoire, Washington State Citizen Corps and a donation from Puget Sound Energy. Mark your calendars! The Annual Hazus Conference will be held in Seattle, Washington, August 10 – 12, 2011, at the Henry M. Jackson Federal Building. Scientists now can track the minuscule motions of shifting plates as they happen, thanks to an expanded network of GPS sensors that covers the region like a blanket and beams back data almost instantly. "If the Pacific Coast or Mount Rainier moves a couple of centimeters, we'll see it within five seconds," said Tim Melbourne, director of the Pacific Northwest Geodetic Array, or PANGA. Once the network's "real-time" functions are fully operational, PANGA will be able to pinpoint some earthquakes more quickly and accurately than traditional seismometers — and eventually issue warnings before destructive shaking hits cities or tsunami waves slam the shore. How Severe was that Quake Anyway?! The magnitude scale is really comparing amplitudes of waves on a seismogram, not the STRENGTH (energy) of the quakes. So, a magnitude 8.7 is 794 times bigger than a 5.8 quake as measured on seismograms, but the 8.7 quake is about 23,000 times STRONGER than the 5.8! Since it is really the energy or strength that knocks down buildings, this is really the more important comparison. This means that it would take about 23,000 quakes of magnitude 5.8 to equal the energy released by one magnitude 8.7 event. Yesterday a lightly attended hearing was held by the Committee on Science, Space and Technology’s Subcommittee on Technology and Innovation looking at renewing funding for earthquake preparedness. Two northwesterners testified: Mr. Jim Mullen, Director, Washington State Emergency Management Division; President, National Emergency Management Association & Dr. Vicki McConnell, Oregon State Geologist and Director, Oregon Department of Geology and Mineral Industries. www.seattle.gov/emergency has a new set of nice publications for citizens with very basic advice to citizens for surviving and earthquake or tsunami. "Triangle of Life" theory is dismissed by quake experts. The technique is not applicable for earthquake experiences in the U.S. The safest response is to "Drop, Cover, and Hold" until the ground stops shaking. With images of Japan’s devastating earthquake fresh on our minds, so is another round of Internet misinformation about what should be your first move during an earthquake. The King County Office of Emergency Management wants you to know that "Drop, Cover, and Hold" is the best method to protect yourself during an earthquake in the United States, especially in our own quake-prone region. www.abc.net.au/news/events/japan-quake-2011/beforeafter.htm has incredible photos of the Japanese earthquake’s aftereffects – as contrasted with an initial view of the same scene. You may think your insurance policy covers your home, apartment or business for earthquakes and floods. The Northwest Insurance Council thinks you should take a closer look, because many people are not insured for such national disasters. The Olympian reports the insurance council is urging Washington residents to consider both earthquake and flood insurance. The council says earthquake and tsunami damage is not covered under most standard homeowners, renters and business owners insurance policies. Earthquake insurance is available as a separate policy or as an endorsement to current coverage. Flood insurance policies are provided through the federal government's National Flood Insurance Program. Gauges at the University of Washington lit up for hours after the initial Japanese earthquake, which now has been determined to be the fifth largest earthquake in the world since 1900. "Unmistakable; any instrument in the world could see this earthquake," said John Vidale, a seismologist at UW. "You can see there are still continuing magnitude four, five and six earthquakes," he said as he motioned to a monitor on Friday. Vidale said he wasn't totally surprised by the massive quake -- it happened on one of the most volatile subduction zones in the world. Local seismologists haven't seen any increased seismic activity on Washington's side of the Pacific Ocean, but Vidale said the event should serve as a reminder that the region is due for a smaller quake. Losses from the quake, tsunami and fires will total at least $100 billion, including $20 billion in damage to residences and $40 billion in damage to infrastructure such as roads, rail and port facilities, catastrophe modeling firm Eqecat estimated. Another firm, AIR Worldwide, estimated that losses covered by insurance could reach between $15 billion and $35 billion from the earthquake alone. It did not estimate losses from the tsunami or the damage to the Fukushima Daiichi nuclear plant in northeastern Japan. According to AIR, the number of Japanese businesses and homeowners with earthquake insurance is relatively low, ranging between 14% to 17%. As a result, the total financial toll for the catastrophe could be considerably higher than the estimate of insured losses. Seattle Office of Emergency Management Director, Barb Graff, pulled out a recent report that gives nice detail to the accomplishments done after the Nisqually Quake in Seattle: quite a lot! Sadly this anniversary comes at a time that funding for the Pacific Northwest Seismic Network is facing significant budget cutbacks threatening many regional services. The recent 6.3 magnitude earthquake in Christchurch, New Zealand, killed many more people and caused far more damage than the September 2010 7.1 magnitude earthquake which struck the same area; the reason: even though this earthquake was weaker than last year's event, it was much shallower; was situated directly under Christchurch; hit during the lunch hour when more people were exposed to damage; and shook sediments that were prone to "liquefaction," which can magnify the damage done by the ground shaking; scientists say the same description nicely fits many major cities and towns in Washington, Oregon, California, and British Columbia. This is (nearly) the title of the latest USGS fact sheet #3023 summarizing what could happen if a 7.1 earthquake happened along the Tacoma Fault Zone, as recently modeled by scientists. Tuesday, 6/8/10, at 8:00 p.m.
Seismic events around the globe offer insight into the super-quake-prone areas along the Pacific Rim. Producer Michael Lienau will join us in studio. Also note that KUOW, 94.9 FM, local NPR affiliate also hosted a series on Earthquakes this last week to apparently coincide with the KCTS show.